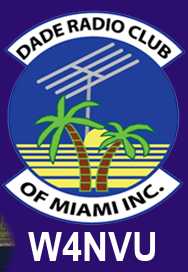 December 2010 Meeting Minutes – W4NVU – Dade Radio Club of Miami Inc.
Ernesto was not present tonight. Jason presided over the meeting and welcomed everyone. We were meeting at II Bambino’s Restaurant for our annual Christmas Party. We have a great crowd. Testing was not being done tonight. Everyone took turns and stated their name and call sign. Jason welcomed everyone again and Joanne reminded everyone to sign in. Carl spoke about the 444.200. He received an email from John Vehicco that the repeater is not working. Robert announced that Saturday, December 11 was the Boy Scout Jamboree at Joe Robbie Stadium. Robert and Virgil attended. The kids were interested in the solar panels and the radios. He thinks we may get a Ham or two out of it. John was thanked for the great job of putting the Christmas Dinner together. Great job! Jason asked if there was any other business. With no other business, Jason thanked everyone for coming. A Motion to close the meeting was made by Robert, seconded by Esther. Voted and passed. The DRC meeting was adjourned at 19:36 and everyone enjoyed their dinner.